Strategically located in the heart's of Bangkok Commercial and Entertainment district, The Montien Hotel, Bangkok offers incredible tranquillity of luxury accommodation marked by 30 years of famous Thai hospitality. Fully rested in the heart of Krungthep (City of Angles) where you can walk to financial district, convention venues, shopping centres and cultural attractions. The landmark lobby with its sweeping staircases and historic murals create a charming ambient. At the Montien you will feel delightfully secluded in an old world haven of tranquil elegance. The ideal choice for business and leisure travellers alike. Offering 475 rooms and suites, including Executive Floors with private lounge, meeting rooms and fully equipped business center, the hotel places the business traveller as well as the leisure visitor perfectly in Bangkok. 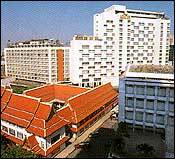 The Montien Hotel, Bangkok on Surawongse Road is your business address in the heart of the city with the most flexible combination of superior accommodation and business facilities to meet your every demand. - Internet and e-mail services. - The hiring of audio-visual and video conferencing equipment, mobile telephones and laptops. - Daily continental breakfast in the lounge. - Tea or coffee served throughout the day. - Complimentary cocktails and snacks in the evening. - Free use of health club. - Complimentary late check-out until 6:00 p.m. Enjoy a cool drink beside our swimming pool set amid a delightful rooftop garden and just keep fit at our extensively equipped Fitness Center. Montien Bankok is proud to offer a wide variety of cuisine include a Chinese and an European restaurant as well as a 24-hours International Coffee Shop. A fully equipped banquet and convention facilities.